Because of a series of graffiti threats, Columbine High School will be locked down Friday, meaning students must stay in the building until the end of the day unless they have an approved appointment. School officials planned to have extra security officers and sheriff's deputies on hand, and staff members will monitor doors. "This is really a precautionary step," said school district spokesman Rick Kaufman. "We believe that we are far enough in the investigation that … nothing will happen." School and sheriff's officials would not say whether the threats mentioned a specific date. Jacki Tallman, spokeswoman for the Jefferson County Sheriff's Office, described the threat as a "nonspecific" message that "harm may come to others." She said the threats were written with either a marker, a pencil or a pen. 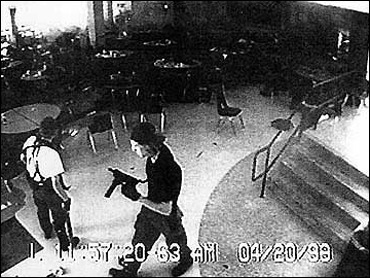 On April 20, 1999 teen gunmen Eric Harris and Dylan Klebold fatally shot 12 students, one teacher and themselves. The school has received a number of threats in the years since the killings and several times has gone to a form of lockdown in response. A few Columbine students said they were more upset with the vandals for creating more of a nuisance for the campus. "I just think it's a goofball thing," said Katie Kocman, a sophomore. "I think it's a stupid thing to do it, but I'm glad the school is taking action on it." The killings at Columbine, while not the first school shootings, spurred efforts at schools around the country to increase security. Threats that were once ignored are now treated seriously, in many cases. Part of the impetus behind addressing these threats is the feeling that Harris and Klebold might have signaled their violent intentions months before they came to school to kill. A year before the massacre, Harris told his probation officer he suffered from homicidal and suicidal thoughts, the Rocky Mountain News reported in October. The newspaper said the teen's admissions led his Jefferson County probation officer to put him in an anger management class. "Eric said he has problems with anxiety and allows his anger to build up until he explodes," a counselor wrote, adding that Harris said he "punches walls" and has "thoughts about suicide." Harris also indicated on a form asking about his emotions that he sometimes felt homicidal. In addition, the News reported, Harris said he had wrestled with anger, anxiety and disorganized thoughts, that he frequently blew up and that he often cried. "Of course the signs were there," Dawn Anna, whose daughter, Lauren Townsend, was murdered in the Columbine library, was quoted by the News as saying. One Columbine student's parents had reported death threats by Harris to the sheriff's department. Randy and Judy Brown had filed a report with the Jefferson County sheriff's office in March 1998 alleging Harris had threatened to kill their son, Brooks, and had written of pipe bombs and mass murder on the Internet. The report was investigated but no action was taken. Harris and Klebold were put in the juvenile diversion program after they were caught breaking into a car in 1998. They were allowed to leave the program early, in February 1999, barely two months before the Columbine attack. As part of that program, Harris and Klebold each met with a diversion counselor in separate sessions on April 7, 1998. That was about the same time that the two started planning their assault, according to the writings and videotapes they made. District Attorney Dave Thomas said many youngsters in juvenile diversion programs made remarks similar to those of Harris. "We do have failures," Thomas said. "Eric Harris and Dylan Klebold were two of those." After he finished the anger management class, Harris wrote a letter contained in his juvenile diversion program file saying: "I learned that the thousands of suggestions are worthless if you still believe in violence."